All good this week on the QB watch. Oklahoma’s Baker Mayfield is going to be an interesting prospect to debate. He doesn’t have the size or arm strength that most NFL QB’s have. However his intangibles are off the charts good. 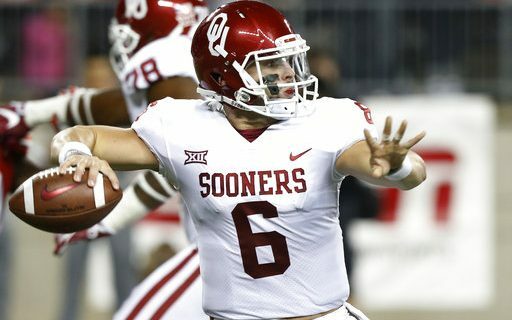 His leadership, poise in the pocket, toughness and accuracy in the short to intermediate passes were on full display in Oklahoma’s upset win over Ohio State. Planting the flag in the center of the Horseshoe will live forever in Sooners lore. How flawless was Mayfield, he completed 77 percent of his passes for 386 yards, three touchdowns and no interceptions. For the second straight week Lamar Jackson took Louisville on his back and led them to victory. This week it was in Chapel Hill over North Carolina. He accounted for 525 yards and six touchdowns. The amazing thing is his offensive line isn’t that good. His best play may have been avoiding the rush then throwing a laser for an 75 yard bomb right on the money. He throws well on the move and of course he is a special player in space. The biggest shock in the USC-Stanford game was that USC dominated in the trenches. I haven’t seen Stanford get pushed around like they did in this one in many years. Stanford had won three in a row and seven of the last nine in this series. The Trojans came out on a mission. Darnold came out hot hitting his first 11 passes. He finished 21 of 26 for 316 yards and four touchdowns. He did throw two picks again this week. Josh Rosen and the UCLA offense stayed on fire vs Hawaii this week. Rosen who led a 34 point comeback last week against Tex A&M stayed hot vs Hawaii. The Bruins cruised to a 56-23 victory. Here are Rosen’s combined numbers since he started leading the comeback late in the third quarter vs A&M until he left the Hawaii game. He’s 46 of 58 for 695 yards nine touchdowns and no interceptions and UCLA has outscored their opponents 91-14. Notre Dame has a way of losing close games under Brian Kelly. Against Georgia it happened again. Notre Dame loses another on possession game at the start of the season. This wouldn’t be news if they hadn’t lost one possession games last year to: Virginia Tech, Navy, Stanford, NC State, Duke, Michigan State and Texas. Kelly’s inability to win the close game maybe his legacy in South Bend. Georgia brought in a true freshman QB on his first road start and pulled out a 20-19 win. Worse was the sound in South Bend. Half the stadium appeared to be rooting for Georgia. When Georgia made a positive play it appeared the game was being played in Athens, Georgia. Washington State made a great comeback late Saturday night to beat Boise State 47-44 in three overtimes. WSU was down 31-10 after Luke Falk fumbled and Curtis Weaver returned for a TD. It appeared Falk’s head bounced off the turf. Falk left the game and never returned. It was Falk’s back-up Tyler Hilinski that led the Cougars to victory. UB’s offense led by Tyree Jackson averaged eight yards per play. UB’s defense held a tough Army team to 21 points. Still the Bulls let a ten point halftime lead slip away and lost to Army at West Point 21-17. Last year UB won a game at home against Army they probably should have lost. This year the Bulls looked like the better team but let it slip through their fingers. Tyree Jackson had a 75 yard TD run and a 48 yard touchdown pass in the first half as the Bulls built a 17-7 halftime lead. Two turnovers in Army territory were the difference as the Bulls had a chance both times to put Army away. Next week the Bulls host Colgate in their home opener.